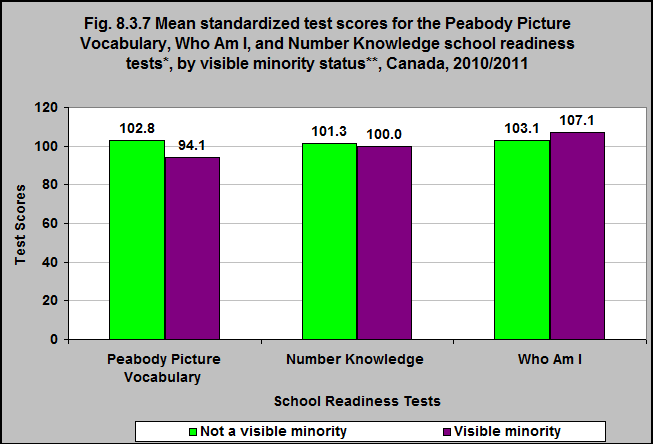 The mean standardized scores on the Peabody Picture Vocabulary and Number Knowledge tests among 4 to 5 year olds are higher among those children who do not identify with a visible minority group** than among those who do identify with a visible minority group. Children from visible minority groups have higher mean scores on the Who Am I test than do those who are not from visible minority groups. **Self-identified as belonging to a racial or cultural group other than “White” (does not include Indigenous).